This is a sponsored blog post; while the views expressed here were genuinely mine, consideration was paid to me by Bays English Muffins to review this product. A few weeks ago, it was 30 minutes until dinner and I was staring blankly into the fridge. 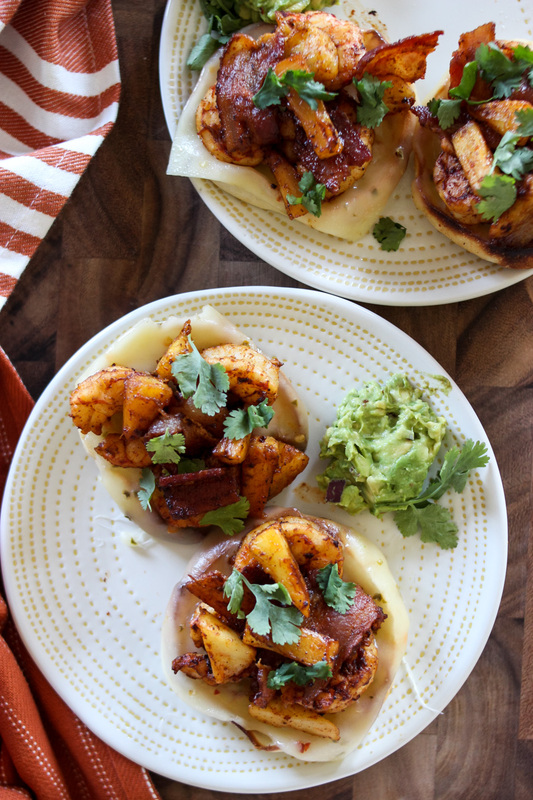 After a long day of running around, I was rattling my brain trying to figure out what to make for dinner that was quick, easy and something that everyone in the family would enjoy. When my eyes landed on Bays English Muffins, a lightbulb went off as I remembered how I used to love eating mini pizzas made from English muffins when I was younger (my mom always bought Bay’s from as long as I can remember). Less than 20 minutes later, we had four happy bellies. I whipped up these delicious Southwest shrimp, bacon and pineapple pizzas in no time and they’ve been on repeat since. While you can’t go wrong with an English muffin for breakfast slathered with butter, they are perfect for all sorts of meals and appetizers. We pretty much always have a few packages of Bay’s English Muffins in our refrigerator for a quick breakfast, snack and lately, fast and delicious dinners. 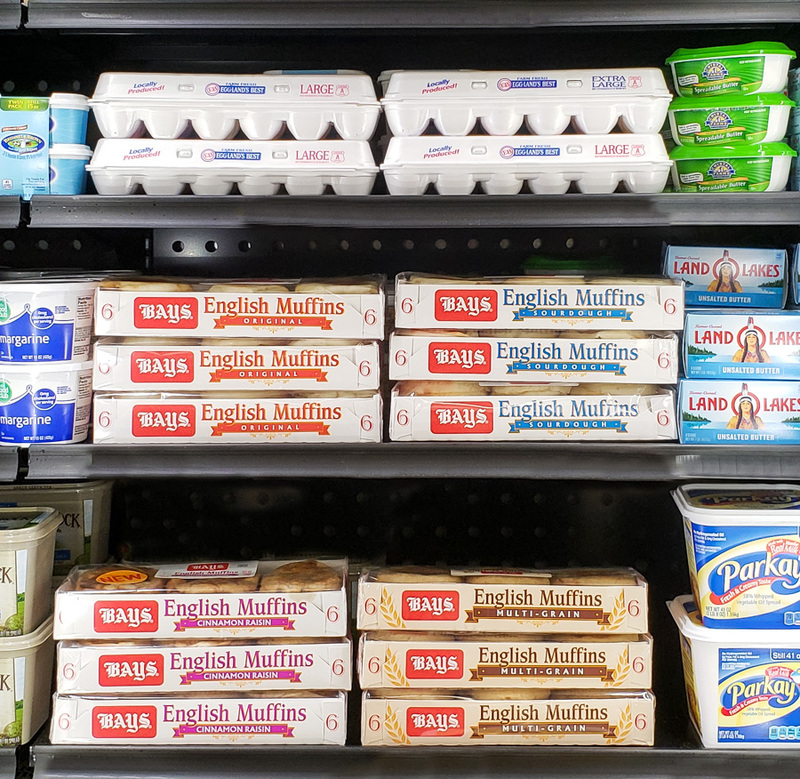 You can purchase Bays English Muffins in the dairy aisle (chilled for ultimate freshness) at your local supermarket. You can find the store nearest you at Bays.com. 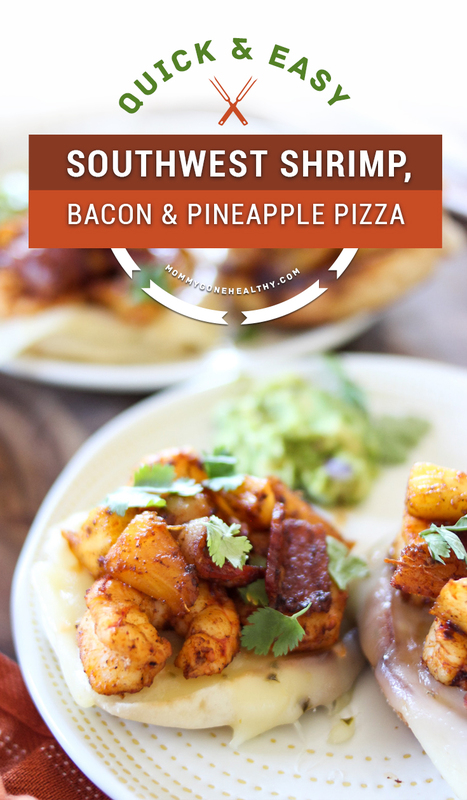 This recipe for Southwest shrimp, bacon and pineapple pizza is oh-so-good and so simple to make too! 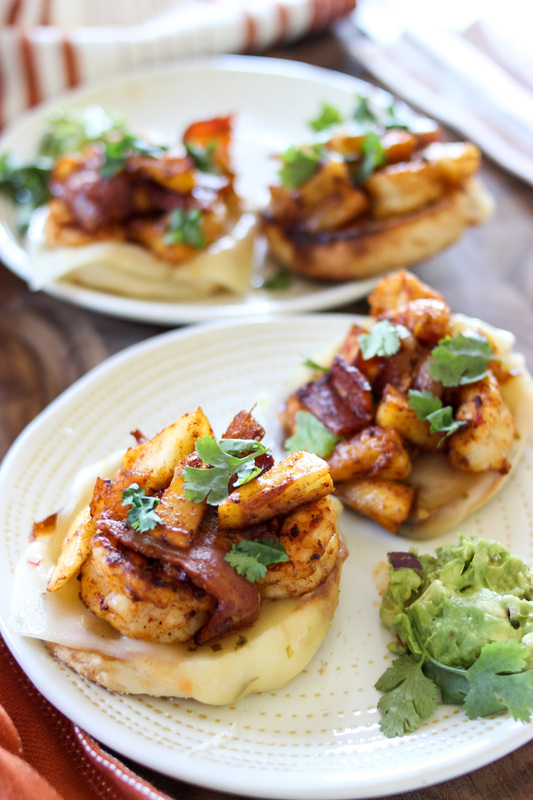 The spicy shrimp combines so well with salty bacon and the sweetness of pineapple tops it off! The English muffin is the perfect consistency to add some chewiness and the pepperjack cheese gives a spicy little kick. This is a great weeknight recipe as it’s low effort, requires few ingredients, is quick to make and healthy too! Not a fan of shrimp? Substitute with chicken! Cook bacon in large skillet over medium heat 4 to 5 minutes or until partially cooked, stirring occasionally. Drain grease and return bacon to skillet. 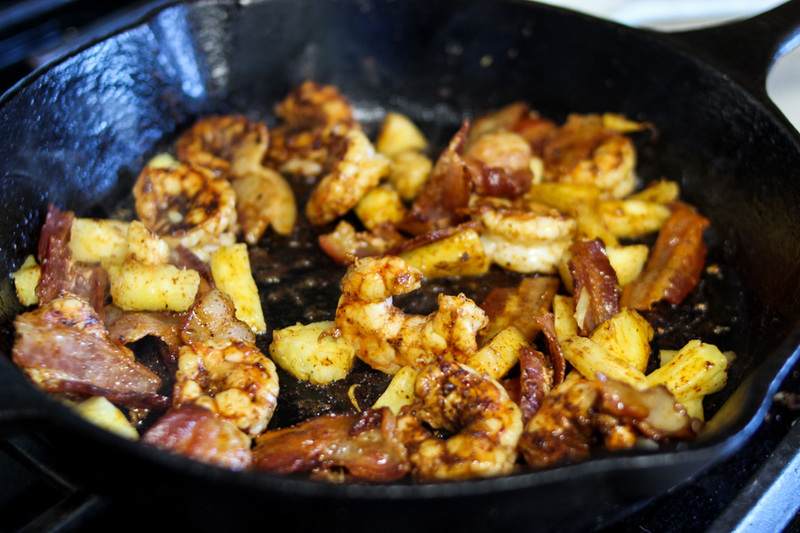 Sprinkle chili powder over shrimp and add shrimp and pineapple to skillet. Cook 3 to 5 minutes or until shrimp and bacon are cooked. Stir occasionally. Toast muffins, Place on baking sheet and cover each muffin half with cheese. Broil 2 minutes or until cheese is melted. Top with bacon/shrimp/pineapple mixture. Sprinkle with cilantro or parsley. Shrimp can be substituted with cooked chicken. 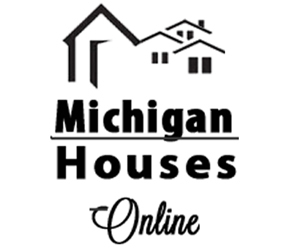 Make sure to “Like” Bays on Facebook for great recipes, fun English muffin ideas, and so much more! What’s your favorite out-of-the-box pizza combo? These look filling and delicious! 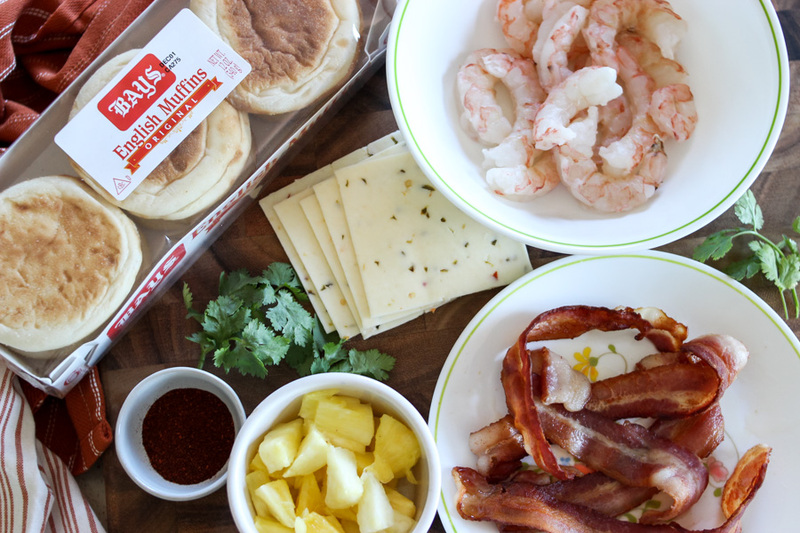 Anything with shrimp and bacon has to be good! This may well be my new favorite pizza flavor combo! 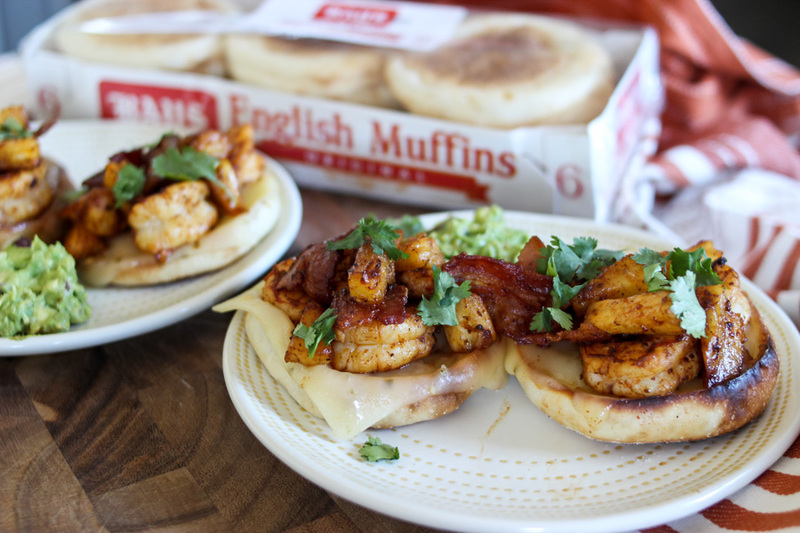 Using English muffins makes this such a great meal for busy days. These would be great for party food, too. This looks amazing to me this morning! 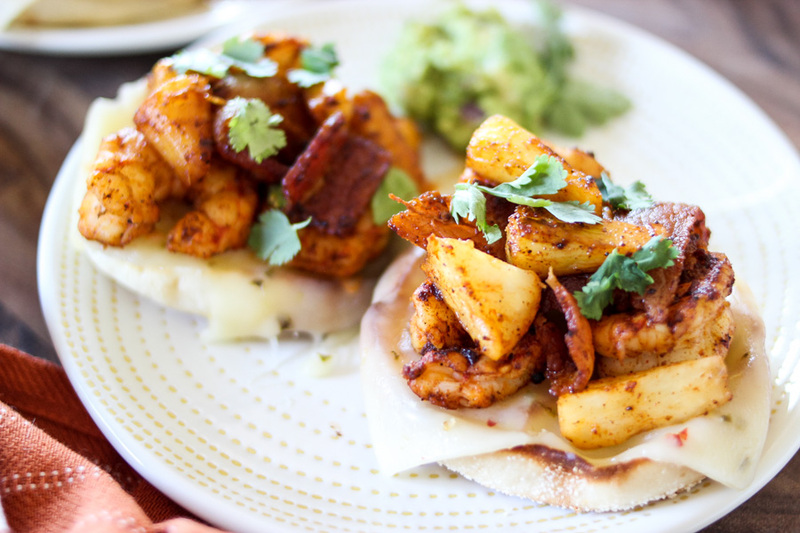 I love how you incorporated the English Muffins into this dish! What a perfect mix of flavor! I love the southwest flavor!